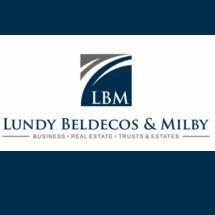 For 30 years, our team at Lundy Beldecos & Milby PC has provided dedicated corporate law services to clients in Narberth, Pennsylvania, and throughout the surrounding area. Offering customized guidance and representation, we help clients navigate the stages of owning and operating a business. To best serve those we represent, our law firm offers free initial consultations, and we accept credit cards. Our team represents small- and medium-sized businesses from a range of industries, including restaurants, food service and liquor, as well as medical and professional practices. Offering small-firm attention with large-firm resources, we counsel clients on matters involving issues such as business organizations, employment contracts, licensing, mergers and acquisitions, business divorce, and intellectual property and trademarks. Our attorneys also represent clients in real estate matters, including construction, architecture, design, and foreclosure and foreclosure alternatives. Recognizing the toll that legal disputes can take on the operation and success of our clients' businesses, we pride ourselves on our accessibility and responsiveness. Our attorneys work closely with those we represent to craft plans for addressing their legal issues that incorporate their specific circumstances and needs. We value our clients' time, and our team works to respond promptly to phone calls and emails. In addition to corporate law services, our team at the law firm of Lundy Beldecos & Milby PC represents clients in personal injury claims. We have seen first-hand the effects of spine, head and brain injuries, and we aggressively pursue the maximum compensation on behalf of our clients in matters involving issues such as car accidents, trucking accidents, premises liability and animal bites. Our law firm also counsels people on wills, trusts and other estate law-related issues, as well as bankruptcy, creditor's rights, loan documentation, collections and debtor-creditor disputes.